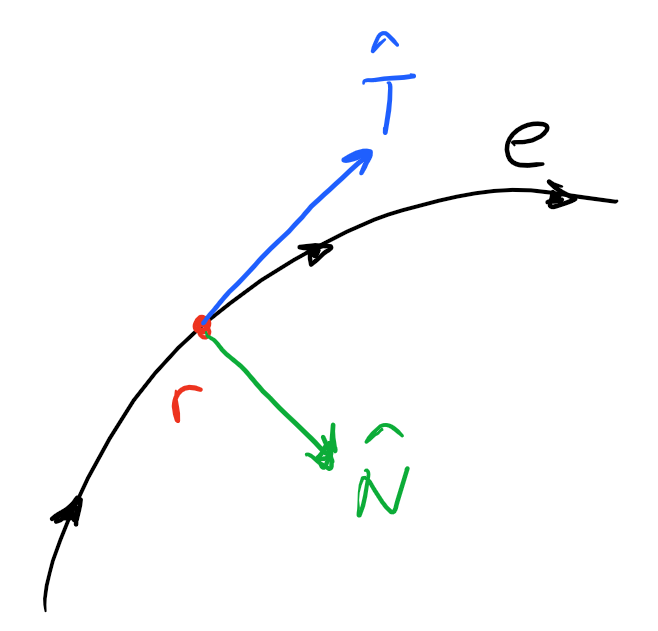 Yesterday, if you remember, I told you that it was the tangential (unitary) vector to a curve or path, so today I will tell you how to calculate and that is the normal vector. Another concept of differential geometry very simple if you understood yesterday. As we know, a derivative gives us the tangential vector, for this reason what happens if we derive the vector ?. Let’s play a little with the previously knowingly, I hope and believe, algebraic operations with vectors are clear. Let your differential is perpendicular. And this would be a definition of the normal vector to the previously counted tangential. Now, like the previous one (and beforehand we are creating a base of coordinates, as you will see much later), the nice thing is to calculate its unit vector, something that does not force us to get a definition of the manga (well, a pair) . And, as we know, the curve, the trajectory, does not have to be rectilinear but, being a function of a parameter (its coordinates) can take “any form.” Since it can take any form, and we have based it as being “soft” (that is, it is continuous for the mandanga of its derivatives to function), the only geometric figure that joins many points that vary according to a parameter is … a curve. And, man, a curve has a particularity, which is curved (redundant) and therefore has curvature. That is, the curvature is always a positive value (for having taken the absolute value) and never has to be 0 because if the curvature is 0, it is a line. Obviously, the curvature will depend, because it is a differential of a function, the point where we calculate it and, if not, it will simply be a function (also). That is, the curvature is a function that varies (in our case) depending on the surface. It’s not complicated to understand. The secret of all this is that now the normal is perfectly defined with its direction since, but we could have infinite normals pointing in two directions. And also, just as the tangential varies in the curve, the normal, it varies equally with it. An example we have in the image titled the post. Remember, finally, that all this that I am telling you is through functions, not values and their calculations or their definitions (because they are functions) are their derivatives. Hence it is differential geometry. So, without knowing it you are learning differential geometry… ta-da!